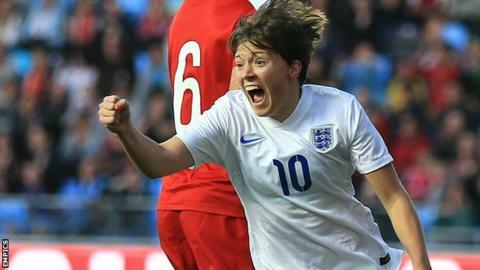 Reading striker Fran Kirby says she was surprised to be included in the England squad for the 2015 Women's World Cup. Kirby, 21, who plays in Women's Super League Two, is the first player from the second tier to be named in an England Women's World Cup finals squad. "It was more surprising than anything else," Kirby told BBC Sport. "Obviously I've been playing well but it is a still always a shock to the system when you get a phone call saying you're going to the World Cup." Kirby, who has eight senior caps for England, was the top goalscorer in WSL 2 last term, netting 24 times in 18 league games. She made her senior England debut against Sweden on 3 August 2014. England have won five, drawn one and lost two of the eight games she has played in. "I'm really thankful to Mark (Sampson) and the rest of the team for putting trust in me," added Kirby, who quit playing football four years ago after suffering from depression following the death of her mother. "Two years ago, I wouldn't have said I'd be anywhere near (the squad). I'm really proud to be here. "I've been playing well for my club, scoring against Arsenal and Chelsea in the Continental Cup last season. "A lot of teams don't know much about me and I'm quite small, so a lot of teams could underestimate me. "I don't know much about them and they don't know much and me, so it plays into my hands more than anything. "The most important thing is gaining experience, especially at my age. I'm hoping to get as many minutes on the pitch as possible."